Amy, a Girl Scout Ambassador from Quincy, had a lot of questions about personal finance after starting her first job. After conducting a survey of students at her school, she found that between 48% and 81% of students surveyed knew little about credit, savings accounts, taxes, loans and checkbooks. Amy worked with a representative from Quincy Credit Union and a student lending manager from AAA to create a series of four financial literacy workshops at her high school. These workshops provided students with information about money skills, budgeting, credit cards and student loans. She also implemented a financial literacy class as a part of the freshman seminar, which will remain a part of the curriculum. Later, a private school in the community reached out to Amy about starting a financial literacy program at their school! 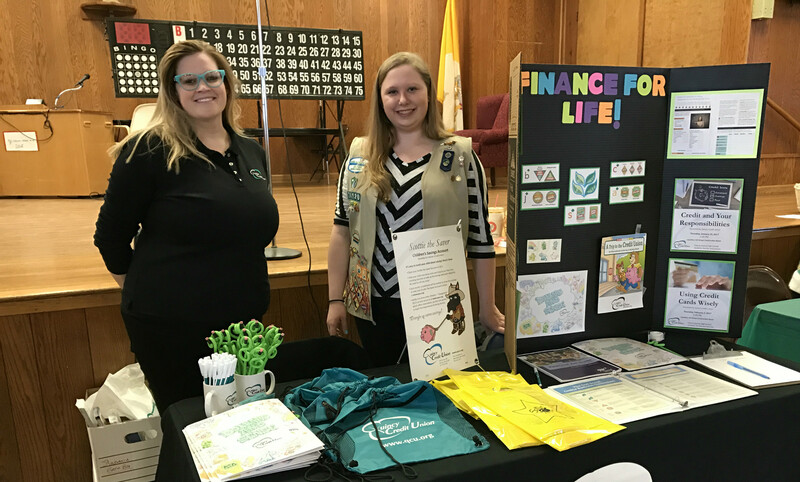 At Quincy’s World Thinking Day, Amy presented the basics of financial literacy, and organized registration for individualized financial literacy workshops for Girl Scouts to earn the financial literacy badge. Thirteen Girl Scout troops signed up for the workshops, and two Boy Scout troops asked if they could participate as well. We are so proud of Amy who is empowering so many through her financial literacy workshops!